Permaculture has taken root at Belfast Cohousing & Ecovillage. 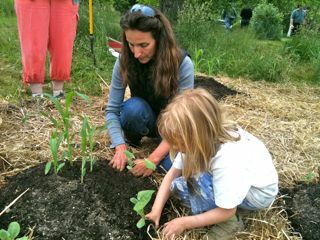 At the June 13th Open House, cohousing adults and kids worked with exploring member Barbara Crowley and equity member and UMaine professor Joline Blais to build a “Three Sisters” garden on the land adjacent to the site. In keeping with these principles, the children’s garden was created without any tilling of existing soil (care for the soil web organisms). The gardeners set down recycled cardboard over manure from Sanna McKim’s horse barn (trucked over and pitchforked by cohousing members Denise Pendleton, Sanna, Jon Ippolito and Jeffrey Mabee) to nourish the soil and suppress weeds, a technique known as sheet mulching. On top of the wet manure and cardboard laid down by Elizabeth Garber and the amendments donated by Mitch Henrion, community gardeners pitchforked household compost from Joline’s rental house in Belfast this past winter into evenly spaced cones about a foot high. On these they placed a layer of mature compost, and planted corn and squash seedlings from Joline’s greenhouse surrounded by bean and nasturtium seeds. The Three Sisters is an indigenous technique Joline learned from her research at LongGreenHouse, a collaboration with Wabanaki elders based on exploring the intersection of Permaculture and Native culture. This plant “guild” combines three plants that most people think of as separate crops but that support each other symbiotically. The corn provides stalks for the beans to climb; the prickly leaves of the squash fend off hungry critters and provide a natural mulch to keep roots from drying out in hot summer sun; and the beans fix nitrogen in the soil for the other two. Nasturtiums—which produce spicy edible leaves, and yummy colorful flowers—grow in the spaces between adding mulch, and producing biomass for increased long term fertility of the soil. A common ‘fourth sister’ —sunflower or its perennial relative jerusalem artichoke—is often planted on the north side of the garden circle, providing beauty, seed for humans and wildlife, and a wind barrier for the crops. 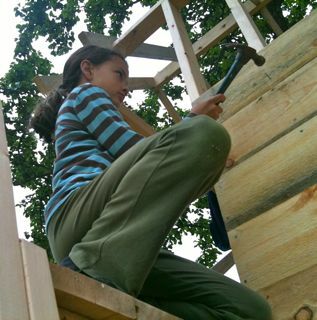 Meanwhile Alan Gibson’s intrepid crew of cohousing kids hammered siding onto the nearby tree house. It will soon be ready for occupancy! Many of us in cohousing are looking forward to gardening together when the adult-sized houses are ready for occupancy—not to mention an enhanced connection to the land and to each other. In the meantime we are happy to practice our care for the earth, for each other, and for the other beings in our ecological community—from worms and mycorrhizal bacteria to birds and children.